Oklahoma school districts are trying to fill more than 500 teaching vacancies as a new school year begins despite eliminating more than 1,500 teaching jobs since last school year, according to a new survey from the Oklahoma State School Boards Association. The combined impact of budget cuts, too few prospective teachers and teachers opting for other careers or out-of-state teaching jobs is even worse than a year ago when schools had about 1,000 vacancies after eliminating 600 teaching jobs. This year’s vacancies do not include positions filled by teachers holding the more than 300 emergency teaching certificates state education officials approved in May, June and July. School districts also have eliminated more than 1,300 support staff positions since last school year. That includes teaching assistants who helped schools deal with a difficult double whammy: inexperienced teachers and growing class sizes. Districts reported 542 teaching vacancies as of Aug. 1. Districts reported eliminating 1,530 teaching positions since last school year. Districts reported eliminating 1,351 support positions since last school year. More than half of school leaders say hiring teachers was more difficult this year compared to last year. Half of districts expect to increase class sizes. The vacancies are widespread, regardless of the district’s size and location and the subject area. 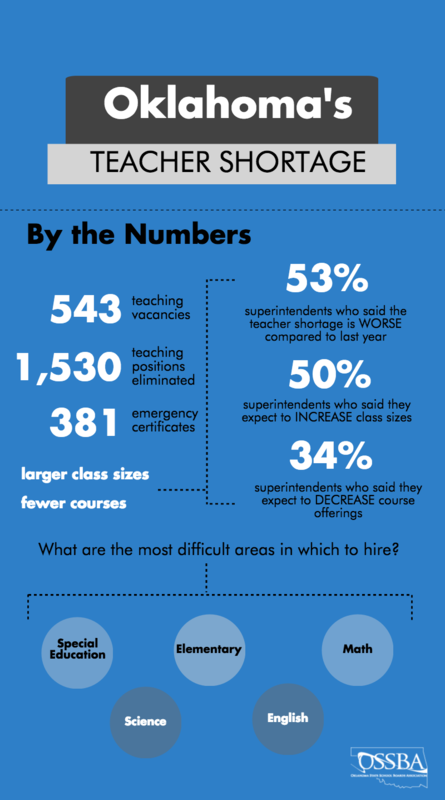 More than half of districts anticipate needing to seek emergency teaching certifications to fill vacancies. Thirty-four percent of school leaders said their schools likely will offer fewer courses this school year. Special education, elementary, high school science, high school math and middle school math are the most difficult teaching positions to fill. School leaders are deeply worried that the overall quality of teaching applicants is having a detrimental impact on student achievement. Nearly all of the state’s largest school districts are projecting class sizes of 26 or more students in middle and high school. More than half of school districts are projecting elementary school class sizes of 23 or more students – above the 20-students-per-class limit in Oklahoma law that’s been waived because of the state’s budget struggles. Budget cuts were the primary factor in districts’ decisions to eliminate teaching positions. Even if that hadn’t been the case, many district leaders expressed doubt at their ability to find certified teachers to fill the positions because not enough new teachers are seeking to fill jobs vacated by more experienced teachers who are leaving the profession or leaving for work in another state. In addition to the more than the 300 emergency teaching certificates already approved for this school year, the state Board of Education is expected to consider as many as 350 more emergency certificate applications when it meets Thursday. Enables a meaningful increase in teacher compensation that’s regionally competitive and empowers schools to hire and keep outstanding teachers. Provides resources schools require to meet the needs of today’s students and students of the future. Rebuilds the teacher pipeline so it’s filled with capable, passionate educators, possibly through the launch of a bold, statewide scholarship or loan forgiveness plan for future educators. Sand Springs has struggled to find certified teachers in core subject areas and described finding special education, high school science, middle school science and high school math teachers as very difficult. The district is projecting 23-25 students in elementary school classes and 26 or more students per class in middle school and high school. The story is similar in Ponca City, where Executive Director of Human Resources Shelly Arrott said the district struggled to fill all its vacancies but likely was successful because the district cut 24 teaching positions at the secondary level and sought emergency teaching certificates to fill 10 teaching slots. The district moved six paid days of teaching training from the summer to the school year to reduce costs. Arrott said the change resulted in a financial hit to support employees who now have fewer contract days. Support employees are being encouraged to take on other extra duty assignments like becoming a crossing guard to help bridge the financial gap. School leaders offered mixed experiences with emergency teaching certificates, noting such teachers typically require more support than other new teachers and many are not returning for a second year. Amber Fitzgerald, executive director of human resources and communications for Enid Public Schools, urged the state to improve its alternative certification process by focusing more on classroom readiness. Gregg Garn, dean of The Jeannine Rainbolt College of Education at the University of Oklahoma, is no stranger to Oklahoma’s teacher shortage crisis. He struggles with recruiting students into the profession. Making the problem worse is the fact that fewer students who graduate from the college are staying in Oklahoma to teach. And as enrollment in colleges of education declines and an increasing number of teachers seek alternative paths to the classroom, he said K-12 students are shortchanged. OU has continuously raised its standards for admission to the college of education and now the average ACT for students entering the college is a 25, Garn said. School districts bordering other states face a particular challenge with recruiting and retaining teachers. Seventeen teachers have left Miami Public Schools in northeastern Oklahoma over the last year, leaving first-year Superintendent Jeremy Hogan scrambling to fill vacancies. The district eliminated 11 positions, has increased class sizes and is offering fewer courses. Dozens of students typically take a third-year Spanish class, but Hogan eliminated the class because he couldn’t find a teacher. The inability to offer a competitive salary and to provide teachers with adequate classroom resources are major recruiting challenges, he said.